Water based dye, changes the color even from black to white. 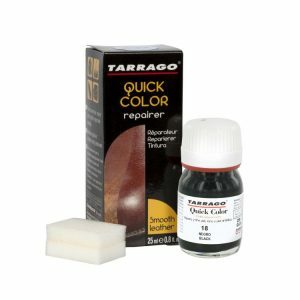 Repairs scuffs, scratches and restores color. Shinny finish. 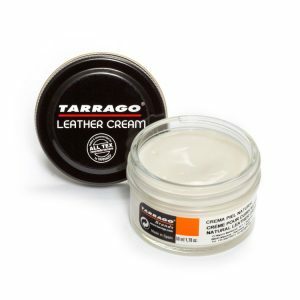 Suitable for leather, synthetic leather and canvas. More than 80 colors. 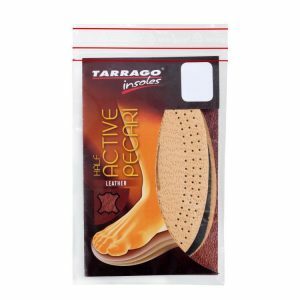 Tarrago Color Dye is a water-based color dye specially formulated to dye or change the color of smooth leather, synthetic leather and canvas shoes and garments. It also repairs scuffs, scratches and other little defects. Its high covering capacity allows changing any color, even from black to white. 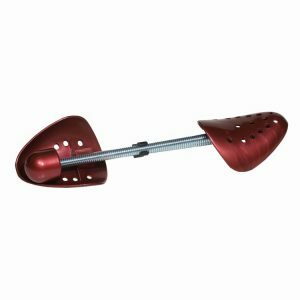 Its finish resists to frictions and doesn’t get cracked. Its shiny finish doesn’t need any polish after application. 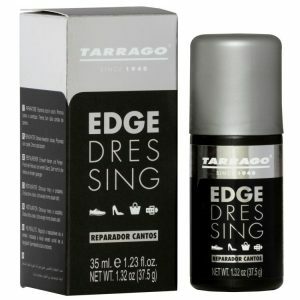 – Box containing 25 ml / 0,85 fl.oz. bottle, paint brush, applicator sponge and instructions guide. 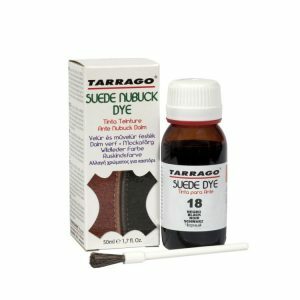 A – Leather: Rub with a used green scrubbing fiber (e.g. 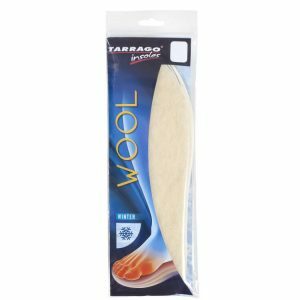 Scotch Brite) or a cloth soaked in Tarrago Preparer**In case of using Color Dye single, apply TARRAGO CONDITIONER, in order to remove any previous finish. 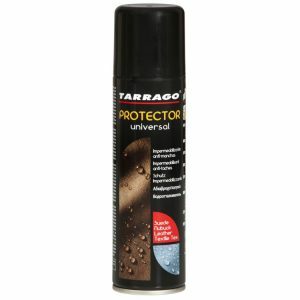 B – Synthetic leather: Apply Tarrago Preparer with a soaked cloth over the surface. C – Canvas: Wash the shoes with water and soap. 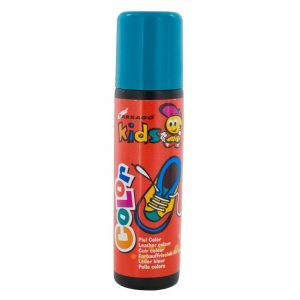 Apply one or two coats of COLOR DYE before being totally dry, following the instructions to dye leather shoes. 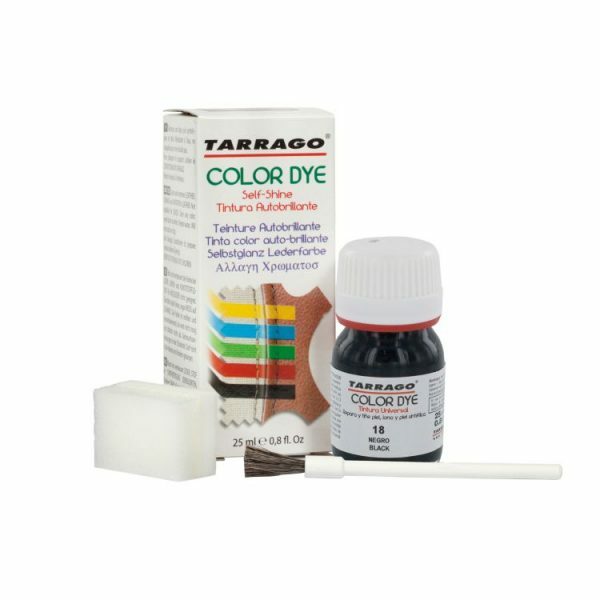 1 – Stir the dye container with the application brush until the color is completely homogeneous. 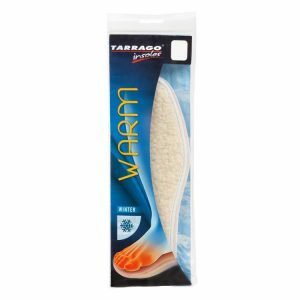 2 – With the application brush semi-drained, apply a small amount of product to a sponge and paint the joint between sole and leather, sewn, scrapes, trim pieces, etc. 3 – Place one or two coats of dye on one end of the sponge. 4 – Rub gently in a circular way over the entire area, adding another coat of product if necessary. Repeat this process until the sponge is nearly dry. 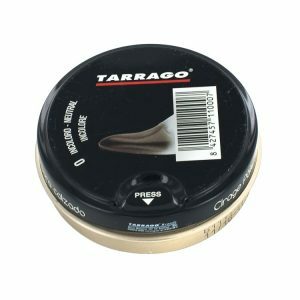 Without adding more dye, you can tap with the same sponge over the surface dyed to match the color, without attempting to cover transparencies. 5 – Once dry the 1st layer, apply a second one following the same process to match the color. Apply a third coat if necessary. 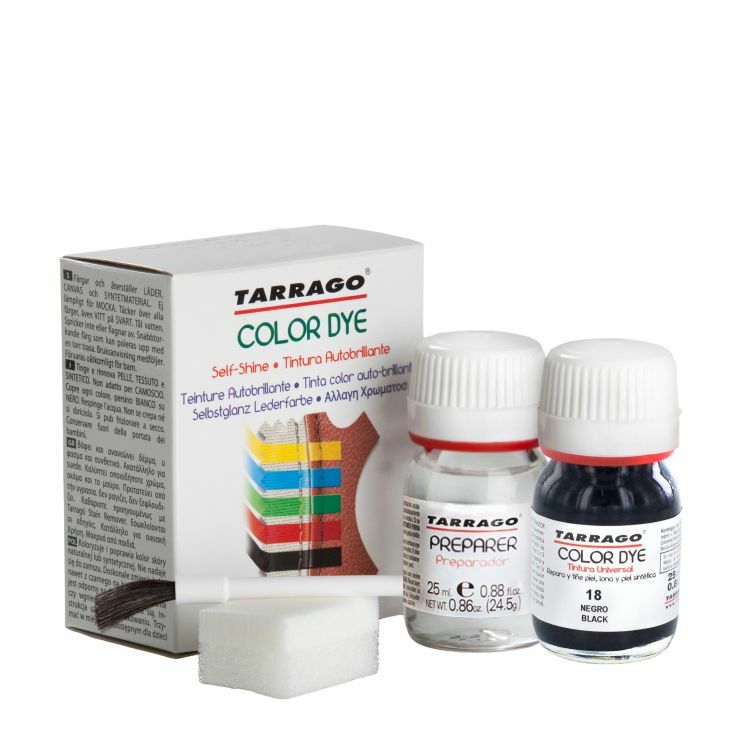 After have applied 2 or 3 layers of COLOR DYE, you will check that the quantity used has been minimal, so the final result will be as a dye and not as paint. Leather will remain soft and flexible and the dye will never get cracked or peeled. In 12 hours, the color will be totally solid and resistant to dry and damp frictions.